Karl Pribram concluded that the mind worked holographically, rather than memory being localized in specific parts of the brain. Attractors form interference patterns, waves in the brain's ventricles. This explaines how patients with parts of their brain surgically removed can still have full memory recall. A hologram also has the ability to store vast amounts of information. "We all shine on; like the Moon and the stars and the Sun." "Oh, Sariputra, Form Does not Differ From the Void; And the Void Does Not Differ From Form. Form is Void and Void is Form; The Same is True For Feelings, Perceptions, Volitions and Consciousness." "Therefore, in the Void There Are No Forms, No Feelings, Perceptions, Volitions or Consciousness." In the Upanishads, the ancient esoteric Hindu scriptures, there are numerous references to the light of the Self and the self-luminous nature of Brahman. Brahman is the “light of lights,” the supreme principle embodied within the “bright throne” of the heart. The Self, the individualized spirit soul, is described as being self-luminous, and qualitatively of the same stuff as Brahman, God or the Absolute. Brahman/God and the Atman/Self are repeatedly associated with light, and described as self-illuminating. The mystic goal is to “unite the light within the Self with the light of Brahman.” The yogi realizes the light of Self, (beyond life and death, pain and suffering, beyond the intellect), as the Inner Self facing in all directions and rooted in the heart of being. Photonic Brain: Illuminative Sacred Light from Ventricles and Pineal DMT. ABSTRACT: This holistic theoretical framework (physics, biology, philosophy) includes the idea that we are light-enabled technology, Photonic Humans. The mass of the physical body exists because there is some informational code of access to an unlimited source of energy mediated by Light. All mass is interaction. Related photic phenomena are described using the informational, material and energetic characteristics of existence, plus the complexity and entropy characteristics of dynamic development. The organization of any biological system is established by a complex electrodynamic field which is, in part, determined by its subquantal components. This field, in turn, determines the behavior and orientation of of psychophysical being. DNA is our antenna. This dynamic is mediated initially through wave-based genomes where DNA functions as the holographic projector of the psychophysical system, a quantum biohologram. Supersymmetry points to a deep link between the quantum realm of particle physics and the quasi-classical realm of protein assembly. All human cultures have a model of the universe (worldview). Primal societies embody their models in mythology and modern societies define their models with science. Science is a rational product of The Enlightenment but has had to loosen itself to some metaphysical notions in light of recent discoveries. Newtonian science is entropic and based in the notion of objectivity; science is involved with the accurate specification of form. Even though quantum physics has captured the public imagination, in everyday life, most people are still stuck in either the Newtonian paradigm or religious paradigms, so the quantum paradigm gives us a useful bridge to a new relationship with reality. Science now understands no objectivity is possible because of uncertainty, indeterminacy. Absolute space beyond the subatomic threshold of dynamic vacuum fluctuation is unobservable or measurable, and therefore metaphysical, beyond physics. Infinite energy density pervades the whole universe. When it comes to discovery of the unified theory, physicists admit it’s a period of utter confusion on the quantum structure of space and time. That is worrisome because it is crucial to describing every force and particle in nature. Relativity is a flawed basis, being incompatible with quantum mechanics. Quantum theory describes the realm of the very small - atoms, electrons and elementary particles - while general relativity deals with gravity. The two theories are immensely successful in their separate spheres. The clash arises when it comes to describing the basic structure of space. In general relativity, space-time is an active, malleable fabric. It has four dimensions - three of space and one of time - that deform when masses are placed in them. In Einstein's formulation, the force of gravity is a result of the deformation of these dimensions. Quantum theory, on the other hand, demands that space is a fixed and passive stage, something simply there for particles to exist on. It also suggests that space itself must somehow be made up of discrete, quantum elements. Paradigms serve important integrative psychological and social functions. They help us read the sacred pages in the Book of Nature. The previous page of pre-scientific wisdom traditions explored the same territory with spiritual technologies. Virtual photons and photons are the key to biology. Photons bridge the gap between physics, biology and philosophy. We are evidence of that Brilliance. The world around us looks classical even though the fundamental laws of physics are based on quantum mechanics. At the atomic level, electrons and protons are blurred entities that cannot be described as point-like particles following trajectories. But macroscopic objects have well defined properties: they are either here or there, and not everywhere. So how does the classical world arise from the quantum? The consensus today is that classical behaviour is an emergent property of quantum systems, induced by their interaction with the environment. When quantum systems interact with the environment, classical properties emerge. This process is known as decoherence. Decoherence makes most of the states of a quantum system unstable, so that only a small subset of all possible states, the 'pointer states', survive the interaction with the environment. So pointer states, dynamically selected by the environment, are the only ones in which macroscopic systems are allowed to exist. In the real world, pointer states are selected by nature. Quantum principles exist in every bit of matter in this universe allowing QM to play a part in biology. The quantum level of functioning is the scale of activity and organization to which the principles of quantum mechanics are found applicable. Examples include electron excitation on the atomic scale and electron transport between molecules. The world around us looks classical even though the fundamental laws of physics are based on quantum mechanics. At the atomic level, electrons and protons are blurred entities that cannot be described as point-like particles following trajectories. But macroscopic objects have well defined properties: they are either here or there, and not everywhere. So how does the classical world arise from the quantum? The consensus today is that classical behaviour is an emergent property of quantum systems, induced by their interaction with the environment. Old models become obsolete when they no longer account for observations and must be revisioned with new meta-theory, new paradigms. How can we achieve model-locking when the basis of our science is in flux? There is no consensus in quantum physics; many theories compete as descriptions of Reality. The Copenhagen Interpretation of Quantum Mechanics (QM) competes with Quantum Electrodynamics (QED), Holographic, Monistic Idealism, Transactional, Post-Quantum, Scalar, Many Worlds (MWI), Topological Geometrodynamics (TGD), String and M-Theory, among others. The secret of Reality may lie in the reconciliation of quantum cosmology, aligning micro-and macroverses. Quantum chaos plays a crucial role in cosmology as choas theory and complexity do in biological systems. How can we make our way through the not quite unified field to the Light of our essential being? Welcome to Virtual Reality. Continuous release and absorption of virtual particles is the deep nature of all matter. The Zeno effect lies at the heart of quantum physics, which states that the energy of an atom moving between two energy states is somewhat uncertain and that (for short intervals) the uncertainty grows over time. For an atom to shift from one state to the other, the uncertainty must be large enough to bridge the two. In the Effulgence of its Brilliance. Quantum electrodynamics, commonly termed QED, is a quantum field theory of the electromagnetic force. QED is a thoroughly tested quantum field theory of electromagnetic radiation, the interaction of charged subatomic particles within electric and magnetic fields. The quantum wave medium is formed from waves of all other matter. The quantum field theory approach visualizes the force between the electrons as an exchange force arising from the exchange of virtual photons. The QED theory describes the way that electrons interact with each other and with magnetic fields through the exchange of photons. QED is an extremely complex theory, but can be linked to biology as we are considering the interchange of particles in a magnetic field, and also in the presence of gravitational and electrostatic fields. The field body is an organised, but enfolded, QED field that directs the interaction of the subatomic particles in the body with other matter and other fields. The form of quantum theory which applies to non-localised phenomena from classical physics such as electric and magnetic fields and sound waves is called quantum field theory (QFT). In this theory, the energy of the respective fields is 'quantised', so that it comes out in packets related to and depending on the frequency. The energy of electromagnetic fields is quantised into 'photons', and of pressure waves in any solid, liquid or gas (i.e. sound waves) into 'phonons' (as in phonograph, telephony etc.). The quantum field theory approach visualizes the force between the electrons as an exchange force arising from the exchange of virtual photons. QED was the first successful quantum field theory, incorporating such ideas as particle creation and annihilation into a self-consistent framework. Both the heart and nervous system set up QED fields and help with information communication within the field body. Quantum Electrodynamics is the extension of traditional thermodynamics that allows calculating the speed at which electrons radiate from a black hole. Consider a virtual electron-positron pair produced just outside the event horizon of a Black Hole. Once the pair is created, the intense curvature of space-time of the black hole can put energy into the pair. Thus the pair can become non-virtual; the electron does not fall back into the hole. 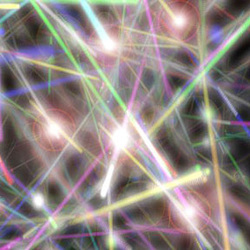 In a bath of photons, virtual photons escape into a photon field. The empty space in our bodies abounds with virtual particles and photons as theorized in QED. Subtle fields work in the “empty” parts of our bodies. If a virtual photon from one electron is absorbed by another electron, another photon is then absorbed by another, long-range forces can interact. Quantic action is photon-dependent. Informational photons can account and be transmitted through large quantic systems. Such a system initiates with DNA. The electromagnetic radiation energy issuing from DNA is coherent. It's not scattered. DNA is a receiver and transmitter of laser light (Gariaev). Quantum Holography defines an admitter/absorber quantum vacuum model of quantum mechanics in terms of annihilation/creation operators (Schempp, 1993). This implies that DNA does indeed behave like a single quantum, which induces a "hole" temporarily in the vacuum by its removal. The emergent paradigm of self-organization permits the elaboration of a vision based on the interconnectedness of natural dynamics at all levels of evolving micro- and macrosystems. A new sense of meaning springs from such interconnectedness of the human world with overall evolution. It is leading us toward complex quantum biology and quantum medicine. This theoretical framework includes the idea that we are light-enabled technology. The mass of the physical body exists because there is some informational code of access to an unlimited source of energy mediated by Light (subspace). Related photic phenomena are described using the informational, material and energetic characteristics of existence, plus the complexity (chaos theory) and entropy characteristics of dynamic development. New physics (hyperphysics) calls for new biology, new medicine, new technology. We need to revision ourselves fundamentally as HOMO LUMEN. At its most primal level, life is a quantum phenomenon. Quanta of light, photons are the building blocks of electromagnetic radiation. All electromagnetic radiation, from radio to gamma rays, is quantised as photons: that is, the smallest amount of electromagnetic radiation that can exist is one photon. Quantum forces encourage transitions for biological molecules to self-assemble. In recent decades molecular biology research has begun to describe basic life processes in terms of elementary particles thus establishing a link to quantum chemistry and creating the new field of quantum biology. Quantum systems and natural selction drive evolution. We begin by assuming that a quantum subsystem, such as an electron translates into what in the biological model is regarded as a signal. Quantum proccesses effect signal transduction. It is distinctly possible that quantum chaos expresses in biological systems right at the transition between the quantum and classical worlds. Chaotic systems may thus be able to amplify quantum effects into global fluctuations. Both biophoton and entangled photon signals demonstrate the quantum nature of photons and are experimental inputs. The non-classical features of biophoton signals highlights the limitations of molecular biology and cannot be accounted in the classical framework of photon emission. The entangled photon signals exhibit quantum non-locality and provide channels for quantum information transfer. The observation of entangled states has stimulated investigations on the nature of reality and information, which are generating new knowledge and insights. Nanotech. Electronic structure theory explains and predicts the properties of ordinary matter - atoms, molecules, and solids. Among these properties are the total energy and electron density, the set of equilibrium nuclear positions, the forces among atoms or groups of atoms, and the time evolution of the nuclear positions. This theory undergirds condensed matter physics, quantum chemistry, and quantum biology, with important applications to materials, nano-technology, industrial chemical production, and medicine. We are evidence of this Brilliance. Physicist Matti Pitkanin says magnetic fields could play key role in the biological information processing if the quantum numbers of magnetic fields serve as carriers of bio-information. "Wormhole magnetic fields provide a quantum mechanism for a control at distance, say of the control of the behaviour of cell organelles by cell nucleus as well as a model for the memory of biosystem in terms of integer valued winding numbers identifiable as quantized momenta of the wormhole supra currents. Quantum selection. In quantum mechanical calculations, electrons in molecules are considered standing waves. The nature of these waves is that of probability fields, from which all molecular properties can be derived. In DNA mutations, the breaking and formation of chemical bonds is always a quantum process, which involves transitions between quantum states and cannot be understood in any other way. Two aspects of this process are important. First, the quantum jumps into empty states are spontaneous; i.e., they are not caused by anything. Second, when a system jumps into a virtual state, the pattern of virtual order becomes actual, real order. There is determinism in this process only in that the pattern of order of a state is precisely determined by the conditions of the system, even before it becomes a real pattern. This simple process can serve as a model of how invisible and virtual, but pre-established order in the universe can be expressed spontaneously in the material world. In principle, the entire universe must be considered a quantum system with visible and virtual states. In the case of DNA, a mutation is the transition from an actual state to a virtual state with a different nuclear distribution. The order that evolves is not from chaos and not from nothing, but from the actualization of virtual states whose order existed long before it was actualized, and mutations can occur spontaneously. Mutations caused by mutagens are stimulated. Molecules also constantly undergo spontaneous transitions. Accordingly, mutations can occur spontaneously without external causes. Spontaneous mutations are uncaused, but they are not unbiased. Differences in transition probabilities will favor the selection of some states over others. This form of selection can be adequately termed quantum selection. Our task of understanding ultimate reality, as distinct from the behavioral properties of quasi-reality, is equally complicated. Virtual photons and photons correlate with all biologicalal quantic change. Can we ever understand ourselves as photonic Beings with Photonic Minds in a Photonic Cosmos? We can begin to wrap our minds around a few of the “subatOMic”issues which mark us as “Photonic Humans”. Kluwer Academic Publishers have just released the book "Integrative Biophysics - Biophotonics", edited by Fritz-Albert Popp and Lev Beloussov, which is based on the Summer school lectures held by the members of the International Institute of Biophysics, Neuss, Germany, in September 2001. The contributions provide the most essential background and applications of biophotonics, a rapidly growing field of current scientific research and applications, based on the discovery of biophotons, a weak photon current emanating from all living systems. Biophotonics provides a powerful tool for the non-invasive investigation of living systems and its findings create the basis for a "integrative biophysics" concerned with the questions of regulation, communication and organization of biological systems. Marco Bischof has contributed a 115-page "Introduction to integrative biophysics" providing the historical and theoretical background for this new transdisciplinary field of biological science and delineating its foundations and its diverse aspects. 1. Can Morphogenesis be viewed as an Energy Complex? It can, if we look at morphogenesis as the interaction of several other processes, like metabolism, anisotropy, and spacially-oriented focus. Modelling a biological mass into a well-defined and genetically conditioned form would take into account substantial substrate, mass transport mechanisms, and driving forces that are spatially-oriented, probably supporting general coordination. If we look at such things as mitosis, spatial differentiation and the influence of active forces appear to be there! Like with crystals, anisotropy represents a full range of energy relationships (electrical, magnetic, thermal, mechanical, acoustic and optical). Such an anisotropy of forces might be genetically coded. Fundamental elements of morphogenesis, like nucleic acids and proteins, are created metabolically. We can theorize that chemical forces exist which are responsible for the process, and that seems to be the easiest solution. One wonders if cells might become periodic emitting oscillators which could control the biological aggregate, causing chemical disturbance over time. (redox, redox, redox). 2. Do photons play a Morphogenic Role? Photomorphogenesis has been accepted in botany, where the length of light waves correlate to specific influences in organisms. Such examples as phytochromic systems may be independent of photosynthesis, and serve the functions of absorbing reds and infrareds. Ultraviolet light has a morphologic influence as well, reaching into the construction of cells and resulting in modifications of subcellular structures. 3. Is there a Bioelectrical Context at work here? In Morphodynamics, it seems both chemical and photonic energy must be involved. In biology, such may be the resule of interactions between photons and electrons in the protein substrate of a semiconductor -- modelling the structural proteins and permutable proteins like semiconductive environments, with electronic processes and chemical reactions resulting in photon phenomena. In such a semiconductive environment, a quantum of light entering might result in photoelectric effects -- a pair, an electron and a hole, is created, as well as a state of excitation at lower energies. An electromotive force emerges, resulting from the photovoltaic effect and the diffusion of current carriers. Many opportunities for photon generation occur: fluorescent excitation, electron acceleration in an electric field, temporary emergence of paramagnetic centers, and emissions from spin relations. There may also be an acoustic reaction or the excitons. The idea of a biological or organic semiconductor is an intriguing one. "The interpretation that emerged already in the 19th century after the discoveries by Galvani, Volta, Svante-Arrehenius, Du Bois-Reymond, was focused in physiology especially on the electrical phenomena associated with life and as the result there emerged the electrochemical theory of these most intriguing processes, a theory respected to this day. But the biochemical and electrochemical model in biology is now a venerable centenarian, and the fundamental point that struck me is expressed in the question: is not modernization of biology imperative? If we have modernized chemistry into quantum chemistry, if there is already quantum biochemistry, if we have modernized Newtonian mechanics into quantum and wave mechanics, modernization of biology is bound to suggest itself, and precisely with regard to the most intriguing point of the connection between the chemical and the electrical processes. And both of these are incontrovertibly certain." "We are in for this shock", An interview with Rev. Prof. Dr. Wlodzimierz Sedlak, Literatura, No. 2, 1978. Void OutMicrophysics wizard, Col. Thomas E. Bearden knows the secret of creation. This remarkable engineer has worked in the space program and science intelligence. But his claim to fame comes from free energy research. He is the master of Nothing. He resonates with Nothing. Like any good magician, he can theoretically produce anything out of thin air—in fact, the thinnest air, a pure vacuum. The dynamic vacuum and its emanations are the unintegrated center of 21st Century physics. Focus is on the threshold where nothing becomes something, the elusive interface of psyche and matter. This light speed target is Zero Point Energy (ZPE), which hints that maybe we can get something for nothing by turning the Void inside out. Unlike top-down mathematically based quantum theories, Bearden’s bottom-up physics matches our experience of this 4-D universe. Bearden’s vacuum theory also accounts for psychoenergetic phenomena, intentionality, and subtle energies. It is a way universal spirit might enter dense matter, crossing the Mystic Veil, the boundary of the metaphysical and physical.Tom Bearden is among the main proponents of Tesla tech in the world today. Nikola Tesla claimed, “Electric power is everywhere present in unlimited quantities and can drive the world's machinery without the need of coal, oil, gas, or any other of the common fuels.”In1891, Tesla described how the aether “behaves as a fluid to solid bodies, and as a solid to light and heat,” and that under “sufficiently high voltage and frequency,” it could be accessed, implying free-energy and anti-gravity technologies. Channels of least resistance exist to translate from one dimension to the other. This power resides in an omnipresent infinite sea of negative energy potential. The secret life of subspace reveals an unseen radiant potential living in the resonating gaps of existence. Probability is highest at resonance. The buffeting of the vacuum fluctuation knocks out an observable photon, shifting the quantum gearbox from virtual energy up to quantal level energy. The mystic threshold has been crossed.Nothing Becomes SomethingThe microcosm of the living vacuum is a coherent organization of spacetime structure. Time itself is compressed energy. “Free energy” emerges from a strong gradient, a negentropic scalar pump, an eternal fountain of cosmic creative energy. Vacuum fluctuation means observable emissions of light rapidly decay back into their zeropoint and then infinitely repeat the photon emission process. This relentless process is almost hypnotic in its appeal.But, let’s not just stare transfixed into The Abyss. Let’s jump into it, because our very survival depends on it.Perhaps the single most important frontier is energy science, the development of cheap, clean energy sources as an alternative to greenhouse gas producing forms of transportation and production. “Let’s do NOTHING.” has been the credo of suppression of these technologies since Tesla’s time. It is now imperative this type of research is allowed to proceed, even against corporate greed. Bearden reiterates that, “At any point and at any time, one can freely and inexpensively extract enormous EM energy flows directly from the active vacuum itself.” But like understanding this new physics, it is easier said than done. Tom has tried to correct fuzzy thinking by pointing out that zero point energy is not energy from the vacuum. Massless observable radiant energy is often confused with nonobservable virtual vacuum fluctuation. So, don’t expect to comprehend just how it works right away. Let these notions sink in gradually and take root as the realization of your own essential nature. Perhaps you’ll find the effects or applications easier to understand than the concepts behind it.Catch the WaveWhen is a wave not a wave? When it’s a scalar or energy precursor, point intensity. A scalar potential, like ripples in a pond, either increases or decreases at each and every focal point throughout spacetime, including inside our bodies. Zero-Point Energy (ZPE) is observable; virtual vacuum fluctuation is nonobservable.Matter boils into and out of existence. In this reiterative process the virtual becomes the observable. Subquantal disordered virtual state fluctuations of the vacuum is the groundstate of existence. Vacuum fluctuation of virtual photons is the universal hum, the OM of the cosmological constant. “Let there be Light.” Potentials in the vacuum are primordial causal agents creating force fields as effects of their interference during virtual photon flux. Charge emits measurable photon energy. ZPE charge becomes observable emission. Real EM photons (quanta of light) are emitted from that charge and spread into 3-space at light speed.Coherent integration implies continuous creation from virtual state energy input. Harmonic sets or series of wave/antiwave pairs form the scalar potential. Internally dynamic scalars essentially pump negentropy or increased order and information into existence as energy and/or mass. Bearden has been promoting this largely suppressed science for decades, going public with reports for the Psychotronic Assn. (USPA) in the 1970’s. Scalars are described as dynamic quantities, which have magnitude but not direction, like vector waves. The vacuum ground state is not completely empty, but seethes with impermanent virtual particles and fields.The flow of mass, and our own mass, through time is generated by the ubiquitous interaction of photons with the mass. This is so for both virtual and observable photons. Mass moves through time by integrating virtual photons, and absorption/emission of observable photons/biophotons. The internal dynamic flow of time has infolded sublevels and engines that pump up the quantum field effects to breech the mystic threshold of observability. Scalars exist only in the vacuum of empty space, including that between our own atoms. Tesla called this form of negative energy, radiant energy. This new physics has been called ether physics, scalar physics, virtual physics, plenum physics, scalar electromagnetics, energetics and psychotronics.By whatever name, Bearden’s main points remain. 1). Nothing contains Everything; 2). we can get something for nothing, and, 3). we are locked into a war of paradigms, against which we must protect ourselves, mentally and physically. Like any seasoned magician or wizard, Tom Bearden’s crowded hyperspace closet contains more than ordinary skeletons. The future isn’t what it used to be in this negative-time reversed paradigm: It is the Bizarro World of materially unstable ghosts, sasquatch, UFOs, ETs, ultraterrestrials, angels, demons, imps, and overunity, which can all bleed into and out of normal reality. The virtual blueprints of everything that ever was or will be, as well as the powers of mind linkage, mass mind control and healing are locked in this universal zip drive.But the bornless domain of this uberspace isn’t in a parallel dimension, so “where” is it? The potential is “everywhere all the time” at right angles to normal reality, in the orthorotated fabric of subspace. There is quantum crosstalk between being and nonbeing. Ordinary and sometimes nonordinary “things” wiggle through ripples and ruptures in the spacetime manifold. The essence of Being is Nonbeing. What IS-IS, but it is undergird by what isn’t. The Heart Sutra insists that all form is inherent in the void, and the void is the root of all form. Ether physics is the science of radiant energy, of virtual particle flux. “Aether” means “shine” in Greek. Light literally matters. Radiance is the fundamental reality of such an unseen, fluidlike source of universal energy. Thus, it is the hallmark of the world’s secret mystery schools. Greek philosophers such as Pythagoras and Plato discussed it at length. Sanskrit Vedic scriptures call it “prana” and “Akasha,” or “rigpa.”The Qigong model calls it “chi” or “ki,” or “mana,” with special emphasis placed on its interactions with the human body in martial arts and acupuncture. Adepts of this tradition learn to manipulate energy, allegedly creating miraculous events, such as levitation, teleportation, bilocation, manifestation, instant healing, telepathy and other spiritual powers. Initiates have stressed the need to “raise your vibrations” for thousands of years. Currently, energy medicine emphasizes holistic self-care of the energy body – the body electric -- for longevity, health and healing. New treatments for the EM fields of the body with low intensity lasers and other forms of coherent light and sound are multiplying. The energetics approach of scalar therapies is touted as the basis of radionics affecting us at the field, quantum and biochemical levels. The body is both formed by and generates bioscalars and biophotons that both condition and signal its health.Our two brain hemispheres constitute natural scalar interferometers (or “engines”) actuating scalar fields.These fields possibly couple to the subtle anatomy of the body like chakras, acupuncture meridians or fields of the heart. The distinction between a living and nonliving system is simply the fact that the living system deterministically uses the inner EM energy channels inside scalar potentials. And those EM potentials are centered on the atomic nuclei of atoms comprising the living system's molecules, cells, tissues, and mass.The mind/brain/body problem can only be solved by looking at this interior energetics, or we will never understand life, memory, personality or thought. The vacuum potential, a hidden internal EM energy channel, is the primary channel of biological control as well as human intent. Scalars are ripples in the fabric of spacetime itself. Matter is a small wave or ripple on the top of this cosmic ocean and life is an even rarer form.As electromagnetic beings, we naturally tap the negentropic potential of our source field. We share that essence. Our bodies are complex modulations of frequencies embedded in greater fields of modulation. We are standing waves in spacetime.ZERO POINT is never directly observed as physical experience. This is reflected, perhaps, in mystical thought by the occult axiom, "I am Isis; no man hath lifted my veil." We can see no deeper into nature than fluctuating fields of energy, which constitute the constant background motion. All that is, is in motion. But it is sustained by the ground state or “cosmic zero.” Random scalar energy is always present in the environment. Psychologically, the vacuum symbolizes the distinction between primordial awareness and the phenomena of mind. Empty awareness facilitates resonance with refreshing cosmic patterning. It allows us to go offline to the phenomenal and “reboot” our systems by drawing on the eternally nourishing source of our being.In more current terms, organized systems exhibit resonances. Resonances lead to synchronized oscillations, harmonized systems. Oscillations represent time cycles during which changes may be introduced. Such changes may dampen or amplify the existing oscillations. Alternatively, they may create new resonances and excite new sets of oscillations. The more complex the system, the greater the likelihood of introducing change into the system during any given cycle. Hence the exponential growth of order or information. Dimensionless virtual/actual particles vibrate across time, forming two-dimensional waves. Interaction of these waves creates holograms, which oscillate across time in various geometric shapes. In turn, they move about in all four dimensions like invisible ductwork energy tunnels. As shaped energy becomes increasingly ordered into evolving patterns of evolving patterns, it begins to manifest electromagnetically as matter. Trying to garner the attention of future generations of scientists, Bearden has generated a great deal of interest in the potential for extracting zero-point energy from the energetic vacuum potential. He calls it Overunity. In the past couple of decades, virtual particle flux has gained scientific acceptance, becoming less mysterious. Potentials can have observable effects on charges even when no fields are present. The potentials are the cause and the fields are the effects. Bearden says, “A longitudinal wave is a time density oscillation,” vibrating in the time domain with zero frequencies. Subtle energies check and balance one another in null summation.Oscillations of the local curvature of spacetime were originally described by Nikola Tesla and Paul Dirac. British physicist Dirac called the vacuum a seething ocean of infinite energy potential, but Tesla engineered applications of non-Hertzian electric waves for wireless transmission. Real world EM vector fields can be assembled by interfering scalar potentials, and likewise, scalar fields are created by destructively interfering vector fields in a nonlinear medium.Technological applications engineer the primordial vacuum, which is called subspace or hyperspace, whether you take a bottom-up engineering view or top-down mathematical view. Like the matter/antimatter polarity, time also has a negative flow, time reversal. The modern vacuum is a fiercely bubbling inferno of fleeting particles. The vacuum has no fixed lengths or rate of time flow, per se. The stress of the vacuum is a sort of conglomerate potential “pressure,” where the individual stresses of various types of particles, if integrated by external means, sum into the overall stress (pressure). Variation of the stress of vacuum between two points in a frame represents a “curved spacetime” or “accelerated frame.”The stress energy of the vacuum means “fragments” of energy, more subtle than electromagnetic energy, turn against themselves and lock into a “vector zero summation.” Two out-of-phase waves travel together as a zero-vector pair; the component waves are “in-phase spatially, out-of-phase in the time dimension”. One of the two waves in each pair is a time-reversed or phase-conjugate wave, a coupled longitudinal EM wave/antiwave pair forming a scalar (time-polarized) wave for that interacting fraction. Time is energy compressed by a factor of c-squared. So it has the same energy density as mass. This zero-point energy of the vacuum is an incredibly dense structure of virtual electromagnetic energy, even at zero degrees absolute. Summary: In a continuous creation, the center of the universe is everywhere and it is a seething cauldron of potential. Everything, every thing, manifests from the temporal interaction with the local nonlinear vacuum of spacetime. The interaction of time and negative time extracts massergy from the limitless ocean of roiling subspace. It manifests the temporal potential of force and form in each and every instant at each and every point of being and our being and becoming. War of WorldviewsYou may be perplexed by now just how scalar physics can affect you in the “real world.” Potentially, we can build devices that help us alter gravity, time, inertia, and the apparent mass of an object, patterning spacetime with electrogravitic energy. Bearden describes “killer apps” that make scalars relevant to us all. Unobservable potential can be transduced and tapped for energy or creating mass. There are methods of direct engineering of virtual particles at a distance, including the formation of virtual and observable charges at a distance. Bearden claims scalar tech has been used for nefarious purposes by nation states and criminal factions at the global level. Psychotronic (scalar) weapons, weather war, mass mind control, nonlocal communications, healing and psi are among the phenomena investigated by multiple intelligence agencies, worldwide. Outrageous lists of scalar disasters can be found on Bearden’s site and in his books, most notably Fer-de-Lance (1986-2003), Excalibur Briefing (1980-1988), and Oblivion, America at the Brink. Weather engineering using high tech scalar interferometers (Tesla Howitzers) includes manipulation of the jet stream, droughts and floods, intentional amplification of earthquakes, tsunamis, hurricanes and volcanoes. North American weather has been engineered for over a decade by means of scalar interferometers, and that HAARP is likely (among other things) an attempt to combat that ongoing weather war rather than to initiate a new one. Machiavellian applications include freezing time, precursor robot wars, dudding missiles, manipulating the nature of mind, artificial life, mind conversion, mass hypnosis, synthetic telepathy, AIDS biological warfare and EM disease propagation. Heat, cold, explosions, implosions, light phenomena (glowing orbs), destruction of electronics, human sickness or instant death, and even psychological phenomena can be created in the minds of those in the target zone. Outrageous lists of scalar disasters, EM weaponry and eco-terrorism can be found on Bearden’s site and in his books, most notably Fer-de-Lance (1986-2003), Excalibur Briefing (1980-1988), and Oblivion, America at the Brink. Physical symptoms of scalar attack include headaches, nausea, dizziness, stomach and intestinal difficulties, weakness, loss or upset of equilibrium, arthritic symptoms, excess fatigue syndrome, various chronic pains and aches, rashes, etc. Chernobyl, downing of shuttle Challenger and submarine Thresher, USS Scorpion, Bright Skies, Yellowstone caldera, HAARP, Woodpecker, antigrav and antimatter drives, etc. Medical Engineer, Eldon Byrd affirmed that “images can be projected directly into a human brain from a distance using the 'scalar' component of a weak magnetic field.”If Tom had his way, he would cure us of disease and the energy crisis and protect us from the horrors of mass mind control and unbelievably powerful weapons. Hopefully, in the future, the new paradigm of scalar physics will be employed for the benefit of humanity. All that is universal is contained in our human essence for we are not separate from that, or one another, or our environment. We are all embedded in the unified cosmic field. All lifeforms are multidimensional virtual vacuum engines. Mathematician, Charles Muses describes the nature of our embodiment: “Actually our bodies are like fountainsThe fountain has a shape only because it's being renewed every minute, and our bodies are being renewed. So we are standing waves; we are no exception.” [virtual dipoles]. Trauma locks up energies in the body, and the self image can become "frozen" and inhibit growth of the personality. This image can be de-structured or liquefied, eliminating the old holographic pattern, and returning all elements to a chaotic state. From this chaos, the new image automatically emerges in regenerated form. This death/rebirth is healing, and may be the mechanism of the placebo effect.Self-image is locked up in identification with a multi-sensory image of self. It conditions the body and its state of health. The process of detachment from one's body, emotions, thoughts, and even the notion of self is a way of dis-identifying with the old outworn model, and creating a nonlocalized impression of oneself as identical with universal consciousness. Self-organizing filaments, or microtubules (cytoskeletal polymer) have liquid crystal properties. Liquid crystals are a phase of matter whose order is intermediate between that of a liquid and that of a crystal. Semiconducting currents can flow through liquid crystals. Microtubules are nanostructures which are the sentinels of the cell wall and motors of cell division. They generate force and motility. The assembly and disassembly of microtubules generates pushing and pulling. Determination of cellular form by microfilaments is directly related to cellular functioning. Furthermore, Ingber (1998) states that "tensegrity structures function as coupled harmonic oscillators" which can provide a basis for nonlocal resonant interactions among cellular structures or entire cells. Defects in microtubule-dependent processes are correlated with a number of human health problems, including cancer, birth defects, neurodegenerative diseases, and sterility. Further, microtubules are common targets for naturally-occurring toxins and synthetic chemotherapy reagents. The function of microtubules is dependent on the dynamic assembly/disassembly of the polymer, as well as the ability of other proteins, known as microtubule-associated proteins (MAPs), to interact with microtubules. MAPs can be separated into two classes, those that regulate microtubule assembly dynamics and those that act as motors to move cellular contents along microtubule "roadways". (Walker). In other experiments optical responses of liquid crystals to underwater acoustic signals have been reported. This could relate to prenatal life. Molecular cargo travels along microtubule highways. Without their liquid crystal structures, called phospholipids, living cells couldn't exist. This cell wall, not the nucleus, is actually the brain of the cell. Arguably, wave functions within microtubules function as the correlate of consciousness. A fundamental role for the cytoskeleton as a memory mechanism has been theorized. Stuart Hameroff and Roger Penrose suggest structured water is involved in consciousness at the cellular level. In "Orchestrated Objective Reduction of Quantum Coherence in Brain Microtubules: The "Orch OR" Model for Consciousness " they write: "Large scale quantum coherence occurring among tubulins (e.g. via electrons in hydrophobic pockets arrayed in the microtubule lattice, or ordered water within hollow MT cores) could take on aspects of a quantum computer in pre-conscious and sub-conscious modes." Hameroff, Dayhoff, Lahoz-Beltra, Rasmussen, Insinna and Koruga (1993) argued that the cytoskeleton provides a solid state network throughout cortical neurons. Furthermore, there is a correlation between production of proteins within microtubules and cognitive functioning. Inhibition of protein production caused cognitive deficits. Pribram (1991) further proposed that the perceptual image is represented as a neural hologram, created by nonlocal resonance among the spines covering the neural dendrites. Sensory stimuli induce resonance among dendritic microprocesses yielding physical changes in dendritic structures analogous to light striking the film in an optical hologram. The totality of these resonances are called the holoscape, providing the basis of both the perceptual and memory image. Living organisms have learned to control the liquid crystal properties of their cells precisely, so that the critical pure liquid temperature is always just above the temperature of their environment. This helps the cell walls stay not only strong enough to protect the contents, but also stay permeable enough for the ongoing processes of life. Ordinary, healthy cells have arrangements of so-called microtubules around them, (see PHOTO PAGE for microtubule pics, this Portal). Like the regular pattern of molecules in a liquid crystal, this seems to provide a relatively rigid structure that appears to control the movement and permeability of cells. The liquid crystal semiconductor matrix of the human body provides a basis for understanding how energy medicine works through the structural matrix of the cell (fascia), the electrical properties of connective tissue. Liquid crystals can be classified into 5 phases; Liquid, Nematic, Smetic, Columnar and Crystalline according to their position order and orientational order. Microtubules exhibit all phases. Any movement of our bodies will generate an electrical signal that is carried to literally every cell we have. As a liquid crystal semiconductor with gates and channels, the membrane is an information processing transistor, an organic computer chip. Bruce Lipton describes the "consciousness" of protein gates in the cell membrane at http://www.brucelipton.com/cellular.php Insight into Cellular Consciousness. Cymatics is the study of wave phenomena and vibrations. The holographic frequency domain is one such wave phenomena, a universal one. The quantum wave function is another. A number of waves crossing each other at right angles look like a woven pattern. The wave nature of light and sound make holography possible. Acoustic holography creates three-dimensional images of a sound field in space and time from three-dimensional sources. Our DNA does much the same in reverse using Fourier acoustics when it projects the geometric template of our form as a soundfield. Ultrasonics has shown that 2-D recodings of soundwaves can be used to generate or recreate 3-D forms. DNA uses this process to create and embody our boudaries. It carries the source geometry or constant coordinates. Thus, embodiment means a translation from the holographic frequency domain to the wavenumber domain. Reconstructing acoustic quantities at low (or microwave) frequencies is usually much easier than that at high frequencies. The double-helix is a crossed linear array. The phased array of DNA creates virtual holograms as templates for pulse holography which creates genuine 3-dimensionality. A wide range of behavioral state-related gene expression (from relaxation, hynosis and sleep to high arousal, performance, stress and trauma) culminate in the production of new proteins or homeostasis, physical and psychosocial adaptation. Behavioral states modulate certain patterns of gene expression. Interaction between the genetic and behavioral levels is a two way street. Genes and behavior are related in cybernetic loops of mind-body communication. Just like aiming sound oscillations at a drumhead creates geometric patterns, certain patterns get fixed in our bodies and finer structure. They influence our ability to survive, feel safe, socialize, and thrive. Eidetic imagery is like photographic memory, an accessible multisensory copy of an original sensory experience. People capable of eidetic memory can recall vivid images in the mind's eye, and examine these images like a photograph. Eidetic Imagery also allows recall of complex images formed by inner experience and memory (Ahsen). Eidetic Imagery helps us re-experience life events with all of their basic elements intact. The primary image, which has external and internal components, helps us process what happens to us, attribute a narrative and meaning to the imagery, and store it in long-term memory that way for future access. How we choose to remember and interpret our experiences characterizes how we recall them. The multisensory image is a fundamental anchor for a symphony of psychophysical processes, since most people are primarily visual. Eidetic imagery is accurate and vivid. It often is perceived as happenING, rather than as a past event. Eidetic imagery relates to memory and trauma and is part of the toxic cycle in PTSD, for example. It becomes EMBODIED in our whole organism. The eidetic image is a direct link to brain modulating chemicals influencing emotional, physical, and spiritual well-being. Powerful imagery replays automatically like a movie strip of film and can retraumatize us. Brain ventricles filled with fluids, the "Great Lakes" of the psyche, may act as holographic 'projection screens' for eidetic imagery. Clinical interventions can be done in any part of the cycle to interrupt the mindbody loop, but to heal the body stress must be released from the whole organism so it can reintegrate disturbed functions. We contend we can also create vivid imagery capable of influencing others at a distance. Likewise sound and resonance phenomena can effect healing at a greater or lesser distance. Visual information can be encoded or decoded as or from sound. The body is an embedded series of crystal oscillators - vibrations, oscillations, pulses, wave motions, pendulum motions, rhythmic courses of events, serial sequences, and their effects and actions. The fundamental and generative power is in the vibration which, with its periodicity, sustains phenomena with its two poles. One pole is form, the figurative pattern. The other is motion, the dynamic process. These three fields - vibration and periodicity as the ground field, and form and motion as the two poles - constitute an indivisible whole. There is a similarity between cymatic pictures and quantum particles. In both cases that which appears to be a solid form is also a wave. They are both created and simultaneously organized by the principle of PULSE. In an attempt to explain the unity in this dualism between wave and form, physics developed the quantum field theory, in which the quantum field, or the vibration, is understood as the one true reality. The particle or form, and the wave or motion, are only two polar manifestations of the one reality, vibration. Our focus in the study and practice of energy medicine should center around how to restore biological coherence to the system so that the living matrix can function fully, bringing vitality and energy to our entire lives. Heart coherence, brainwave entrainment with Schumann's Resonance, and relieving stress on the Cranio Sacral nerves freeing the Vagus nerve all contribute to recalibrating our well-being, even though we are continuously immersed in the electromagnetic "smog" of modern life. Understanding why the microtubules have these liquid crystal properties, and why they lose them, is likely to prove useful in the war against cancer, which is unrestrained cell proliferation. Recently scientists have come up with perhaps the most surprising role yet for liquid crystals: as models for events that took place at the beginning of the universe. As the liquid crystals cooled, the patterns were just like those in the early universe. As Above; So Below. Every cell in the body is linked by electromagnetic contact with the toroidal-shaped magnetic field of the heart, mirroring the relationship of Earth with its organisms. Heart rate mediates stress response and balance of the relaxation response. The connective tissue matrix, with its semiconducting and liquid crystal holographic structure, resonates with these field changes. In 1973, Miller, Webb and Dickson described DNA as a holographic projector (see "Embryonic Holography"). In other words, genes encode and express themselves via light and radio waves, or acoustical holography (see "Quantum Bioholography", Miller, Miller and Webb, JNLRMI , 2002). Delocalized interference patterns create calibration fields (blueprints) for our bodies' space-time organization. The system works as a biocomputer -- a wave biocomputer. DNA can also function as a gel-like liquid crystal, emitting a weak laser-like light that can be converted into an electro-acoustic signal. 1. The organization of all biological systems is established by complex electrodynamic fields. We are fundamentally electromagnetic, rather than chemical beings. Wave interaction (and therefore cymatics and holographics) is a key determinant of biological structure and optimal functioning. Biosystems are sensitive to natural and artificial electromagnetic fields. Perturbations in environmental fields can induce changes in organisms informed by those fields. Field frequencies and amplitudes affect our biodynamic state. Liquid crystals (DNA, brain ventricles, and cellular structures) in the human body may operate as antennae for detecting and decoding such global and local ELF signals. Beal (1996) proposes that liquid crystals (which are an intrinsic part of cell membranes) act as a detector/amplifier/memory storage device for ELF EM patterns in the environment. Proteins, tend to orient themselves in the 10-Hx resonant EMF, so would be extremely sensitive to ELF changes in the 10Hz region. A coherent wave-field may emerge from the body's own liquid crystal (LC) matrix. 3. There is a strong correlation between behavioral disturbances in humans and periods of solar and geomagnetic field turbulence. Conversely, studies show that subjects living in isolation from geomagnetic rhythms over long periods of time developed increasing irregularities and chaotic physiological rhythms - which were dramatically restored after the introduction of a very weak 10Hz electrical field. Early astronauts suffered until SR generators were installed in their spacecrafts. 4. Geomagnetic anomalies (tectonic strain, earthlights, geomagnetic field perturbations) can induce some forms of anomalous cognition - such as auditory and visual hallucinations, and TLTs (temporal lobe transients or small seizures). Also, one of the effects of meditation is to "quiet the mind" as a method of allowing the "free-run" (or silent thalamic periods) to become entrained by natural geophysical rhythms. This form of tuning or "magnetoreception" is mediated by the pineal gland, (30% of its cells are magnetically sensitive), and organic magnetite-containing tissues. 5. Optimal global ELF (calm night; low sunspot activity; low EM pollution) conditions can facilitate anomalous cognitions, including psi such as ESP, remote viewing, and remote healing. "Brainwaves (particularly in the alpha range) can be transmitted along the perineural system (or via Frohlich excitation) to any distal parts of the body, and even to adjacent organisms, via ELF EM waves. These frequencies can be amplified by closely-related Schumann resonance waves, or by feedback mechanisms typical of the body's physiological pathways (akin to immunologic and neuroendocrinologic cascades). In turn, these basic frequencies can re-activate stalled healing processes, enhance growth, accelerate immune responses, and generally "jump-start" functions inherent to the body's tissues, by "rebalancing its energies" (according to Oriental medicine) or (in Beal's terminology) by re-configuring the liquid crystal orientation of cell membrane components and thus triggering specific intracellular responses." We are proposing, along with Pitkanin and Sidorov, that the Schumann resonance may be the substrate for a radar-type extrasensory perception mechanism common to all living beings. Like water bouncing off of rocks and other submerged objects, this non-specific frequency is absorbed and re-radiated in unique interference patterns by all objects it encounters. Once recaptured, the patterns are then decoded by the brain. In this Fourier-type transformation the information is translated into conscious data, much like other sensory processing. Conversely, specific effects may be imprinted as bioinformation and made to exercise a "mysterious action at a distance", once the signal wave reaches the target. That pattern, in turn, may, under the right ("pre-requisite") global conditions, avoid routine dissipation and become instead coupled to the dominating ("state-of-consciousness") standing wave that is picked up and carried by the Schumann resonance. Mental intent may function as a variable window of transmission/reception in the exchange of extrasensory information. Tuned into the Schumann resonance, it may carry such bio-regulating information to distant targets and act as a primitive, radar-type sensory interface. All these and more mechanisms depend on the SR frequencies staying within their median range. In a prior, "first-thoughts" essay discussing the presence of Schumann frequencies in the EEG during various healing practices we had proposed that mental intent might function as a variable window of transmission/ reception in the exchange of extrasensory information, which tuned into the Schumann resonance to carry such bio-regulating information to distant targets and acted as a primitive, radar-type sensory interface (Sidorov 2001). However, pursuing this line of thought soon leads to the landmark experiments of Robert Becker - who, it became evident, had not only reached somewhat similar conclusions based on his own body of evidence, but had gone beyond them to suggest that such subtle currents could reach far deeper into our genetic and consciousness control mechanisms. After nearly eight decades of EEG and other brain imaging studies, it is sobering to realize that we still can't tell with certainty where EEG voltages come from (Becker 1985, pp 88). It is conceivable that Becker's perineural system and/or the LC - liquid crystal matrix of the organism (including, but not limited to, connective tissues, cell membranes and DNA) might act as a full-body array of sensory receptors for Pitkanen's magnetic sensory canvas signals, with specific excitations patterns coding for different types of information. "The ecology of the soul is to recycle one's consciousness." Herbert Frohlich (1988) discovered the whole living network vibrates continuously at light frequencies as electrical potentials moved through the liquid crystal structures within tissues forming a high-speed network. The formation of our organisms is related to the science of cymatics where sound is related to strucural forms. Sound and coherent light are foundational and the means DNA uses to construct and coordinate communication throughout the body (Gariaev). These subtle fields of EM forces have been called many names throughout history - the aura, chi, prana, orgone, bioluminescence. Many hands on, energetic, and movement therapies and high performance doctrines are based around their manipulation. The synchrony or desynchrony of these signals impacts our health and well-being. This is tied to our ancient fight/flight response. Resonance therapies help us recalibrate our systems, whether through meditation or energy work. The body is our holographic memory, a vast system of information storage at a cellular level. Plasmas and BioplasmaPlasma is the fourth state of matter (liquid, gaseous, solid). Living organisms are plasmas. Plasma physics has merged with biology; life is a highly energetic system, not just chemical processes. The optimal adaptation to receive any kind of information and relay it instantaneously to the entire mass of the system is found in plasma. Significantly, low-frequency biological rhythms display relations with the geophysical environment. The alpha rhythm of the human brain has a frequency of about 10 Hz, which is the same as the frequency of magnetohydrodynamic oscillations of the ionosphere, and of the vibrations of the Earth's crust. Magnetohydrodynamics is based on magnetic transmission over a plasma carrier. Sedlak proposes that magnetohydrodynamics (MHD) can be used to model living bioplasma. Plasma unites in itself the phenomena of electrodynamics, electronics, and hydrodynamics, even in the absence of a fluid medium. One of the manifestations of this situation is magnetohydroydnamic waves (MHD). The wave propagation of magnetic field fluctuations in plasma is analogous to ripples in a fluid medium, accompanied by real transport of magnetic energy. Therefore, a biological system possesses its own magnetic information, highly sensitive to external field variations and unusually responsive to spin variations in organic structure. Biophotons are weak emissions of light radiated from the cells of all living things. A photon is a single particle of light. Plants, animals and humans generate up to 100 photons per second, per .15 square inches (1 sq. centimeter) of surface area. The light is too faint to be seen by the naked eye, but biophotons have been detected and verified using photomultiplier tubes. According to a leading researcher of biophotons, German biophysicist Fritz-Albert Popp, light is constantly being absorbed and remitted by DNA molecules within each cell's nucleus. These biophotons create a dynamic, coherent web of light. A system that could be responsible for chemical reactions within the cells, cellular communication throughout the organism, and the overall regulation of the biological system, including embryonic development into a predetermined form. The laser-like coherence of the biophoton field is a significant attribute, making it a prime candidate for exchanging information in a highly functional, efficient and cooperative fashion, lending credence to the idea that it may be the intelligence factor behind the biological processes. An aspect of, or cousin to consciousness, though this remains speculative. Biophoton emissions will vary according to the functional state of the organism. If a disease such as cancer affects certain cells they will radiate a different photonic signature than healthy cells of the same type. In this way biophotons can be a noninvasive tool for assessing the state of health or vitality. Applications can extend far into other areas like testing food and water quality, checking for chemical or electromagnetic contamination, or agricultural testing for products that improve crop resistance to disease. Biophysicists in many European and Asian countries are currently engaged in such research. Proponents of alternative medicine see a possible connection between biophotons and natural healing techniques. For example acupuncture is based on manipulating or exciting "ch'i" energy -- the vital life force that, according to ancient Chinese belief, regulates body function and is responsible for well-being. It is suggested that the meridians or energy points used by acupuncturists may tap into node lines within the biophoton field. It is further hypothesized that all living things might be connected together through dynamic biophoton fields. A Russian scientist discovered bipohotons in 1923, dubbing them mitogenetic rays. Though Professor Alexander Gurvich’s discovery sparked wide research, it wasn't until 1974 that Popp proved their existence, revealed their origin in DNA, and subsequently their coherence. Popp's biophoton theory provides an intriguing and promising path for more international research, which could lead to major developments in our understanding of life, the mechanisms of healing and health, and our interconnectedness with the world around us. Though skeptics relegate much of this to pseudoscience, research may eventually shed light on biophotons for us all. According to the biophoton theory developed on the base of these discoveries the biophoton light is stored in the cells of the organism - more precisely, in the DNA molecules of their nuclei - and a dynamic web of light constantly released and absorbed by the DNA may connect cell organelles, cells, tissues, and organs within the body and serve as the organism's main communication network and as the principal regulating instance for all life processes. The processes of morphogenesis, growth, differentiation and regeneration are also explained by the structuring and regulating activity of the coherent biophoton field. The holographic biophoton field of the brain and the nervous system, and maybe even that of the whole organism, may also be basis of memory and other phenomena of consciousness, as postulated by neurophysiologist Karl Pribram and others. The consciousness-like coherence properties of the biophoton field are closely related to its base in the properties of the physical vacuum and indicate its possible role as an interface to the non-physical realms of mind, psyche and consciousness. The discovery of biophoton emission also lends scientific support to some unconventional methods of healing based on concepts of homeostasis (self-regulation of the organism), such as various somatic therapies, homeopathy and acupuncture. The "ch'i" energy flowing in our bodies' energy channels (meridians) which according to Traditional Chinese Medicine regulates our body functions may be related to node lines of the organism's biophoton field. The "prana" of Indian Yoga physiology may be a similar regulating energy force that has a basis in weak, coherent electromagnetic biofields." ABSTRACT: Complex information can be encoded in EM fields, as we all know from coding and decoding of television and radio signals. Even more complex information can be encoded in holographic images. Gene-expression is the mechanism by which new patterns are called into being (Rossi, 2000). There is also a strong correlation between modulation of the brain’s EM field and consciousness (Persinger, 1987; McFadden, 2002). The Gariaev group has discovered a wave-based genome and DNA phantom effect which strongly supports the holographic concept of reality (Miller, Webb, Dickson, 1975). This main information channel of DNA is the same for both photons and radio waves. Superposed coherent waves of different types in the cells interact to form diffraction patterns, firstly in the acoustic domain, secondly in the electromagnetic domain -- a quantum hologram -- a translation process between acousticall and optical holograms. Hypothesis: The organization of any biological system is established by a complex electrodynamic field which is, in part, determined by its atomic physiochemical components. These, in part, determine the behavior and orientation of these components. This dynamic is mediated through wave-based genomes wherein DNA functions as the holographic projector of the psychophysical system - a quantum biohologram. A model of the mind-body relationship is developed in which novel biophysical principles in genome function generate a dynamic possessing attributes consistent with both our psychophysical nature and consciousness. The model invokes a fractal link between neurodynamical chaos and quantum uncertainty. Transactional wave collapse allows this link to be utilized predictively by the excitable cell, in a way which bypasses and complements formal computation. The formal unpredictability of the model allows mind to interact upon the brain, the predictivity of consciousness in survival strategies being selected as a trait by organismic evolution (King, 2001). This quantum evolution is orchestrated by the information transduction of DNA. The Gariaev group (1994) has proposed a theory of the Wave-based Genome where the DNA-wave functions as a Biocomputer. They suggest (1) that there are genetic "texts", similar to natural context-dependent texts in human language; (2) that the chromosome apparatus acts simultaneously both as a source and receiver of these genetic texts, respectively decoding and encoding them; (3) the chromosome continuum acts like a dynamical holographic grating, which displays or transduces weak laser light and solitonic electro-acoustic fields. A soliton is an ultra stable wave train that arises in the context of non-linear wave oscillation. The DNA reading process can be modelled as a complex mechanical oscillator capable of producing solitonic wave transmissions. DNA, modelled as a kind of rotary pendulum can be simulated as a chain of non-linear oscillators. Complex dynamic patterns arise when taking into account the non-linear covalent connections between nucleotides. The same researchers suspect the ability of chromosomes to transform their own genetic-sign laser radiations into broadband genetic-sign radio waves. The polarizations of chromosome laser photons are connected nonlocally and coherently to polarizations of radio waves. Thus, we have an explicit physical analogue for the traditional mystical apprehension of inner Light and the Audible Life Stream. This is the main information channel of DNA, the same for both photons and radio waves. Superposed coherent waves of different types in the cells interact to form diffraction patterns, firstly in the acoustic domain, secondly in the electromagnetic domain -- a quantum hologram -- a translation proccess between acoustical and optical holograms. Recent discoveries by Russian scientists Peter Gariaev, et al and later speculations by Vladimir Poponin shed tremendous light on our proposal that the human being is a transducer of universal energy and consciousness -- essentially a biocomputer. The neww feature of this research is the ability to physically demonstrate subtle fields emerging from the quantum foam or vacuum potential. This makes the effect quantifiable and measurable -- objective. Gariaev discovered the DNA Phantom Effect in 1985, when he worked in correlation spectroscopy of DNA, ribosomes and collagen in the Institute of Physics, in the Academy of Science of the USSR. He was first able to publish his results in 1991, leading to a book in 1994, Wave Based Genome. His DNA Phantom Effect demonstrates a dynamic new field in the vacuum substructure by bombarding it with coherent laser light and coupling it to conventional electromagnetic fields. Recent trends in quantum physics have been focusing on quantum field theory (QFT), rather than the particle physics of quantum mechanics (QM). QFT is the application of quantum mechanics to fields. It provides a theoretical framework widely used in particle physics and condensed matter physics. The extension of electromagnetic theory suggests a role for the physical vacuum in the organism. Quantum Field Theory purports to be the most fundamental of sciences in that it concerns the ultimate constituents of matter. The term "quantum field theory" is used interchangeably with "particle physics" and "high energy physics" on the grounds that the experimental support for this theory comes from expensive experiments involving high-energy beams of particles. In particular, the quantum theory of the electromagnetic field, known as quantum electrodynamics (QED), is one of the most well-tested and successful theories in physics. The fundamentals of quantum field theory were developed between the late 1920s and the 1950s, notably by Dirac, Fock, Pauli, Tomonaga, Schwinger, Feynman, and Dyson. But the 21st century sees their integration in biological processes. There is great interest among those studying subtle energies to identify the agents and dynamics of the vacuum potential and its vast energy reserve on our essential nature, the fieldbody. Some argue that the quantum field, also known as the information field is the quantum potential. In this nonlocal model, everything is connected informationally to everything else, superluminally. Other call it a virtuality rather than potential. The potential is that which is not yet realized (not real), whereas virtual is that which is not yet actualized (but IS real: q-fields, q-forces, sub-q particles as VIRTUAL (and real) rather than POTENTIAL. At what point is the immanent made material? Is information a non-material substance, (whether a force, an epiphenomena, a tendancy, whatever), or is it STUFF? (particles as teeny-teeny bits of information)and, where does shape come into this? Pribram wrote about the Fourier transforms in the brain, and that the perception was not explainable in terms of discrete places, but as a pattern of distribution that made a wave, and it was the wave that was perceived. For any holographic paradigm of Consciousness, there must be some sort of media for the hologram to live in. (Holograms cannot exist without some sort of media.) The media is the subquantum or virtual particles, which comprise all of everything else, all matter, all forces, and the various forms of Consciousness, both physical and non-physical. The brain/body acts as a very sensitive “radio receiver”, with each being “tuned” to its own “sub-quantum holographic hard drive”. DNA serves in a similar capacity to a radio’s tuning capacitor, though incredibly more complex). It tunes the body’s bio-energy field (“Aura”. Orgone, Chi, Kundalini, Prana, whatever one chooses to call it, depending upon background and predisposition) acts as the “antenna” (a bridge to the sub-quantum realm, where their “hard drive” is actually stored. This is the medium “medium”, so to speak ), and, of course, the “Holographic Sub-Quantum Hard Drive” storing, not only your memories (“data”), but the “programs” that comprise your personality. We are not dealing with an actual physical construct, as the sub-quantum realm exists outside of space-time. Think of your individual “storage space” as “whirlpools in the river”; i.e., “personal” holographic storage space, rather than being “partitioned off” from the rest of the sub-quantum realm. It is actually part-and-parcel of the holographic “fabric” of the sub-quantum realm. You can access your “data” and “programs” strictly by virtue of their physical/energetic resonant signature. This explains Jung’s “Collective Unconscious”, and the “Akashic Records” of the ancient Tibetans. Further, we can see how supposed “reincarnation” functions: We can make the analogy to cordless phones/cell phones and “crossed signals”, due to a crowded frequency spectrum - something with which we are all familiar. While everyone’s physical/energetic signature is unique, there are bound to be certain “overlaps”, which allow a person living NOW to “tap into” the “quantum hard drive” of someone who is “dead”. That person’s “data” and “programs” still exist in the sub-quantum realm, and are thus available to be “tapped”, providing that one can “get into resonance”, or “tune” to that person’s signature. Mediums do this voluntarily, while in cases of reincarnation (and, at the extreme end, “possession”), there is a certain amount of resonance purely by chance. Incidentally, this also explains “genetic memory”: as the DNA is so instrumental in the “tuning” process, it can be understood how people of close genetic relation, thus sharing elements of their DNA, may “tap into” ancestors’ memories. A brief review of the non-local nature of any realm outside of space-time is sufficient to answer questions about remote sensing: since space and time are illusory constructs confined to “space-time”. The “mind” exists in the sub-quantum realm, OUTSIDE of space-time. Since the physical body is a tuning mechanism, and does not immediately decay upon physical death, the tuning apparatus remains relatively intact for a period of time. And, if we look at the work of Wilhelm Reich, explaining the energy dynamics of “Orgone” (Chi, Prana, etc. ), we can see that the Bio-energy field (“Aura”, etc.) will remain coherent and attached to the physical body for a period of time as well. Thus, our receiver, antenna, and of course, the “sub-quantum hard drive”, are all intact for quite a while after death. During this time, the consciousness may de-focus from space-time, as can also happen during “Astral Travel” and/or “Remote Viewing”...and if the body is revivified, these memories may be retained, and a NDE is then reported. Certain constructs seem to be reported by various people: “Christians” may see “Jesus”, or other appropriate religious figures, while Buddhists see Buddha, etc., etc. I explain the “form follows energy” principle, and show that the more mental energy is given to a construct, whether in THIS “space-time” realm, or any other, the more “real” it becomes. The content is part of the enculturation program. Thus, with BILLIONS of human minds lending energy to their various belief systems, it should come as no surprise that people find what they EXPECT to find in the NDE state. I even posit that space-time itself may be the result of a group of entities in the sub-quantum realm having “concocted” space-time, in much the same way that programmers of Virtual Reality systems create “worlds”, either for entertainment, or for university educational programs. All living cells from plants to human beings emit biophotons, ultraweak photon emission of electromagnetic wave in the optical range of the spectrum. Biophotons can’t be seen with the naked eye, but can be detected. All organic and inorganic compounds have inherent electromagnetic resonance. The inherent resonance is the compound’s unique electromagnetic signature or signal. Chemical compounds absorb electrical, electromagnetic, and magnetic energy by altering their molecular and atomic geometry. As the molecule relaxes the alterations in geometry return to their normal configuration. The compounds then emit multiple radio frequencies of their own characteristics plus heat of specific infrared frequencies. Russian medical researcher Professor Alexander Gurvich discovered what he called mitogenetic rays in 1923. Though studied briefly in the intervening years, biopontons again generated great theoetical and experimental interest in the 70s. In 1974, German physicst Fritz Albert-Popp proved the existence of biophotons, their origin from DNA and later their coherence (laser-like nature). Russian biophysicist Peter Gariaev has confimed and built on this foundation with his own DNA hologram research. Popp developed his theory to explain the plausible biological role and potential control mechanims of biochemical process, such as growth and differentiation. Though not yet a full theory of life, noted scientist Herbert Frolich and Nobel winner Ilya Prigogine have accepted Popp’s results warmly. Today, the International Institute of Biophysics, headquartered in Germany (founded 1992), flourishes in over 10 countries. In this article, Sedlak discusses how a living organism is not only an information detector and generator, but is also a transformer of electromagnetic energy. Biological systems generate their own magnetic mediums through a process he calls "dia-par", or diamagnetic to paramagnetic transition. Sedlak proposes that the science of magnetohydrodynamics (MHD) can be used to model living bioplasma. He predicts that this model can account for such phenomena as spin- waves, anabolic to catabolic transitions, and redox processes. Such low-frequency biological rhythmic activity can probably be accounted for by MHD mathematics, the proof of which he leaves to future generations. Wodzimierz Henryk Sedlak was born in Sosnowiec, Poland, on October 31, 1911. He completed his studies in 1951 at Maria Curie-Sodowska University, where he received his Doctorate of Science in Mathematics and Natural Science. In 1967 he was appointed Head of the Department of Theoretical Biology at Catholic University in Lublin. His main fields of interest included bioelectronics, paleobiochemistry and paleophysics. Throughout his career he published well over 100 papers and several books. As a theorist, he proposed new models in biological and geophysical sciences from common concepts. As a cross-disciplinary polymath, he painted pictures with broad brush strokes on the nature of reality itself. His ideas have a potential to influence medicine, psychology, anthropology, and philosophy. His papers represent snapshots of how he saw the world rather than expressions of traditional experimental approaches, and are rather synthetical and not analytical statements of "how things are". Many of his ideas were initially rejected by analytically oriented scientists. He pictured living systems as a part of a greater whole, connected from the smallest to the largest levels by electromagnetic interactions spanning vast regions of the spectrum. His concept of bioelectronics enables a paradigm shift from classical mechanical to quantum systems insofar as the nature of life is concerned. He is the author of many concepts which now characterize newer interpretations in biology, which somehow percolated through the Iron Curtain to influence the development of new ideas in the western world. Together with Szent-Gyorgyi and others who are at the foundation of the 21st century concept of "Homo electronicus", Sedlak now takes his place in history as one of the founding fathers of "frontier science". He died at the age of 81 on February 17, 1993. Knee jerks and body movements are dramatically seen as a function of mentally directed protocols. It appears that mental protocols that send out thoughts and energy, even from distant points around the world, directly affect targeted individuals in the laboratory. Remote thought energy interacts directly with physical motion detection systems via the human body. Mankind would thus appear to be closely tied together, as energized thoughts can literally become enacted at a distance by a target that is open to their reception. They appear to be extraordinary cases of information transfer in remote communication, like telepathy and telekinesis, that is, remarkable instances of a new understanding of quantum entanglement. Breathing patterns are found to significantly change according to mental protocols of agitated Turbulence or of loving Quietness. Comparisons are made relative to Initial Calibrations taken before the targeting protocols begin. Quasi-static electrodynamic energy fields in the surrounding laboratory environment are also found to drastically change as a function of the targeting mental protocols. Numerous large coil sensors indicate substantial changes in frequency spectrum energy densities around the subject's body and in the local environment. Something very important is happening here. These many physically measured phenomena directly correlate with directed thought energies sent by the mental protocols. Amazing! Such findings are unveiled through dozens of simultaneous physical measurements on protocol targets and on the local laboratory environment, where large telltale signals have evolved. This paper presents a detailed overview of these findings via a wide cross section of frequency spectrums of simultaneous physical measurements. There are many graphs here, but they are easy to read and the exposition of the findings is in the details. Building upon these rather amazing discoveries will undoubtedly change life and the world from that which is presently known. It will be helpful in reading this Part 2 paper to first read the Part 1 paper entitled, "Mind-Matter Entanglement with Geomagnetic Fields". The folks who so graciously participated as "mental senders" in this experiment were "live" Baltimore seminar participants of channeler, Steve Rother, who led the group with short mental protocols while laboratory target events were recorded in Providence, Rhode Island. Continued follow up on this project of several experiments will continue through Steve Rother's channeling website, www.lightworker.com. This Knee Jerk Experiment was performed on a May 27, 2004. The results are extraordinary and most profound. The experiment consists of seven sequential 128-second measurement periods that correspond to the seven experimental protocols: #1-Initial Calibration, #2-Send Turbulence and Random Knee Jerks, #3-Send Love and Quietness, #4-Send Sync Knee Jerks Right, #5-Send Sync Knee Jerks Left, #6-Send Love and Quietness, and #7-Final Calibration. Each data file contains 64-channels and each is sampling data at 128 samples per second for 128 seconds. Fourier transform frequency spectrums are performed on all channels of every file, as shown throughout this paper for a quantitative measure of energy excitation over the specified frequency range. Frequency spectrums run from 1 to 8192 data points, corresponding to 0.0078 Hz to 64 Hz. Hence, 1 Hz = 8192/64 = 128 data points. Digital resolution is thus 0.0078 Hz. All graphs are plotted in terms of data points and the frequency associated with any desired data point is: Frequency = (Data Point Value)/128. Local geomagnetic field fluctuations are seen to dramatically change as a function of directed mental protocols. These same fields are also changed and uniquely altered when measured in close coupling to the human body. It appears that mental protocols that send out thoughts and energy, even from distant points around the world, directly affect the local geomagnetic fields in accordance with love and healing type intentions. Mankind would thus appear to be closely tied to Earth's geomagnetic fields, as quantum entanglement vehicles of information transfer, fields that underlie extraordinary forms of communication such as telepathy. Alternative vocabularies can now speak of unifying connections among mankind via a measurable web of love, as seen through such field fluctuations of Earth's magnetic grid. These findings are unveiled through dozens of simultaneous physical measurements on mental protocol targets and the laboratory environment, where large telltale signals evolve. This paper presents a detailed overview of these geomagnetic findings through of a wide cross section of frequency spectrum graphs of simultaneous physical measurements. There are many graphs, but the exposition of these findings is in the details. Simply put, the mind of man is entangled among other subtle objects throughout the world, according to directed mental protocol, and these graphs present some of the empirical evidence. Building upon these rather amazing discoveries will undoubtedly change life from that presently known. This paper embeds three equally important primary facets: experimental, experiential, and theoretical, where the first is most expansive as I am an engineering physicist. The three facets need be held on an equal footing for the science developing herein to gracefully unfold. Traditionally, the scientific method has not included the experiential facet as an indispensable part of scientific enquiry along with its well developed experimental and theoretical facets. The observer was simply presumed to be, de facto without much further ado, unconnected to the objects being studied. This is blatantly not so in these mind-matter entanglement experiments, where a discriminating play among the observer, the process of observing, and the observed come into being. Indeed, the primary purpose of this paper is to show that the experiential is a macroscopic world phenomena integrally tied to the experimental and theoretical, and it is measurable by the instruments of physics. The need for the simultaneous existence of the three facets is covered in a background paper that outlines this work, “Experimental Program in Mind-Matter Interrelationships”, which was presented at "Quantum Mind 2003" at Univ. of Arizona. This paper also contains many photos and descriptions of sensors and instrumentation setups that are typical of these experiments. Exploring the physiological substrates of temperament variations has brought forth some ground-breaking scientific research into possible neurological origins of resilience. Among the leaders in this task has been Stephen Porges (1992), who reported that "[m]easurement of cardiac vagal tone is proposed as a method to assess on an individual basis both the stress response and the vulnerability to stress" (p. 498). His methods involve monitoring the neural control of the heart via the vagus nerve, as indicator of homeostasis. He explains how the parasympathetic nervous system (PNS) regulates all of the body's homeostatic (visceral) functions by (a) activating its "accelerator" (the sympathetic nervous system, or SNS) in order to marshall its defenses on behalf of the body's internal systems, and/or (b) applying its "brakes" to that system in order to calm things down and return the main flow of energy to the body's inner processes. Usually these two ANS systems function synergistically, one the reciprocal of the other. Occasionally, however, they are characterized by dual activation, as they are during sexual arousal, or by dual inhibition as in situations involving states of high physiologic stress vulnerability and low levels of SNS protection from stressors. Because of its role in mediating the action of the "gas" and the "brakes" on the heart muscle in response to the demands placed upon the body, Porges (1992) demonstrated how the variations in tone, or responsivity rate, of the vagus nerve can reliably be used as a measure of a person's ability to cope with stressors. Since the body's "default setting" is in the PNS, or resting mode, high vagal tone would indicate a body at rest. Conversely, a low vagal tone would depict a stress-response by the SNS. Even in the womb there are critical periods of vulnerability to suboptimal conditions (Nathanielsz, 2001). Growing bodies, even as simple societies of cells face special challenges. Shortages in exercise, nutrients or oxygen, or too many toxins, and problems in the development of sexual identity can cause the fetus to makes choices that may haunt it in the future, altering genetic blueprints. Brain development takes priority, but may rob the organs of nutrients and create undesirable structural changes. Symmetrical growth retardation, normal growth and ultimate body size are related, as well as age of onset of sexual maturity. Each cell makes a choice to divide or specialize at some point, and the process is irreversible. Making up fetal deficits is difficult if not impossible. The stress-response (stress axis) in the brain and endocrine system is programmed for life in the womb. The stress-depression link or stress vulnerability is programmed before birth. Those who over-react to stress, pre- or post-natally tend toward depression, blunting the daily ebb and flow of cortisol. Optimal, not perfect, womb environments require a well-nourished, low stress atmosphere, soothing the 9-month ride. Even then, birth-order (or premature birth) makes a significant difference. 1. Vulnerable periods occur at different times for different organs in the body. 2. Programming has permanent effects that alter the body's response in later life and can modify susceptibility to disease. 3. Fetal development is activity dependent. Normal development is dependent on the baby's continuing normal activity in the womb. 4. Programming involves several different structural changes in important organs. 5. The placenta plays a key role in programming. It is a hormone-producing gate-keeper. 6. Compensation carries a price. In an unfavorable environment, the developing baby makes attempts to compensate for deficiencies. However, the compensatory effort made by the baby often carries a price. 7. Attempts made after birth to reverse the consequences of programming may have their own unwanted consequences. Problems may arise when postnatal conditions prove to be other than those for which the fetus prepares. 8. Fetuses react differently to suboptimal conditions than do newborn babies or adults. 9. The effects of programming may pass across generations by mechanisms that do not involves changes in the genes. Porges' (1992) study measured the cardiovascular reactivity of neonates. About half of the infants were full-term, healthy newborns, and the other half were high-risk preterm babies who had reached the approximate age of a full-term infant. All measurements were taken while the infants slept in order to screen extraneous effect from the readings. It was found that the high-risk infants had a significantly lower pre-stressor vagal tone than did the full-term infants, indicating that the preterm babies had limited PNS energy-resources with which to regulate their internal state when subjected to stressors. In other words, these babies were functioning with a limited or defective PNS braking and accelerating system, placing their health at risk from both interior and exterior stressors. Some of Porges' other findings in relation to resilience included the observation that high vagal tone in infants is strongly associated with (a) development of young babies' visual recognition memory; (b) more rapid habituation of novel stimuli, or learning; and, (c) more sustained periods of attention. Researchers have found these skills to be "sensitive, prophetic signs of later intelligence" (Kagan, 1995, p. 555) Porges continues, Moreover, the limbic system, assumed by psychophysiologists to modulate autonomic arousal solely through sympathetic excitation, has direct inhibitory influences on the cells of origin of the vagus...Parallelling this increase in vagal tone are increases in self-regulatory and exploratory behaviors. (1992, p. 503). Thus it would appear that, as Goleman (1995) similarly predicted, high vagal tone, as a measure of one's stimulus-threshold, and thus one's attention-shuttling ability, (Wilson & Gottman, 1995) facilitates intellectual and psychological development processes in children leading to potential higher IQ scores and a scholastic advantage as they approach school age. Porges (1992) extended his resilience research to include several related physiological effects of vagal tone's influence on body functions in adults. He found that hypertension involved people "with lead feet," so to speak, who kept the SNS "accelerator" pushed to the floor with little or no "braking." Diabetes, in keeping with this metaphor, is often suffered by those more easily overwhelms individuals with low vagal tone who chronically "ride" or "depress" their PNS brake. Later we will return to Porges' work to examine the more intricate details of his research methods and finding in regard to this amazing system of energy "checks and balances." We will then be looking at how it all ties in with universal patterns of energy distribution management. For now it is sufficient to have some idea of what resilience looks like as a function of our body's responses to stressors and to know that some people are born with more efficient PNS acceleration and braking systems than other, giving them a distinct evolutionary advantage in the area of psychophysiological resilience. By extrapolation from the above findings, we now have a more efficient way to "drive," or modulate, our PNS-regulated bodies. (e) We then saw how the characteristic behaviors, thoughts and attitudes of an individual appear to be influenced by his morphogenetic types, subject to possible modification through modulation of gene expression in the body. The better we understand how the functions of mind and body are interconnected, the more consciously we can work towards finding creative solutions to their respective pathologies. Resilience is actually a holistic model of a consciousness-expanding process, involving the mutual interactions of self-reflection and self-correction at the individual and collective levels of our existence. Thus it is incumbent upon us to pause and reflect how each of us is influencing, for better or for worse, the structural integrity of the global tensegrity structure within which we are a tension-bearing member. I've come to believe that science at its very core, is a spiritual endeavor. Some of my best insights have come to me through what I can only call a mystical process. It's like having God whisper in your ear...It's this inner voice that scientists must come to trust. Not satisfied with the theoretical limitations posed by science's current "nature versus nurture" paradigm, we set out in Part I and II to find a missing third, invisible factor, which might actively be involved in the resilience process. We found one which could acknowledge the reality that life is a process composed of more than the sum of its resilient parts. Piaget (Seigler, 1991) gave us the terminology we needed to connect all of the psychological models into their basic underlying theme. Ideally, life is an ongoing equilibrative process of accommodative assimilation of sensory information and its eventual development, through its necessary evolutionary stages, into resilient coping skills and adaptive behaviors. Variations in the efficacy of this information transduction process have been shown to be the result of several kinds of incoherencies created through energy-diminishing interference effects of both nature and nurture upon a person's overall life-energy state at any given point in time. We have also suggested that through various therapeutic techniques, holistic healing could be effected in these areas of energy-blockage by holistically re-organizing habitual neural patterns through focused intentionality. Self-organizing emergence of a new self image automatically changes beliefs, thoughts, feelings and behavior. This restructures, reframes and re-equilibrates the life-draining effects of pathological wave-patterns into more life-enhancing ones. It reduces the dumping of autotoxic metabolic by-products of stress into the bodymind. The holographic language of quantum mechanics, describing the various relationships of energy movements through spacetime provide an effective way of conceptually reframing, or transducing, the theoretical information that eventually seems to be emerging from within the non-linear, pre-linguistic states of the collective unconscious. We resolve that the very existence of the mysterious third force (inclusive of and yet supraordinate to the forces of nature and nurture) is evidently quite intimately involved in the evolution of this resilient process that we call life. A working definition of the qualitative state of resilience shows a range of variability within which our psyches can function in order to maintain a stable, harmoniously adaptive balance of life energies. It is in search of the function of this resilient state that we began our philosophical journey through Part IV. We are at this moment participating in one of the very greatest leaps of the human spirit to a knowledge not only of outside nature but also of our own deep inward mystery. Part IV refined psychological and biological information discussed previously. Its more ethereal, spiritual aspects were defined in terms of mystical concepts of life's origins presented in Carl Jung's (1961) "Seven Sermons to the Dead." The gnostic terminology was translated into contemporary scientific models from cosmology, quantum physics, chaos theory, synergetics and holography. Within the infinitely expanded horizons provided by this new resilience frame of reference, we discovered that all of life seems to exist as an infinitely finite cycling in and out of the balanced states of wholeness. This is perfectly coherent energy, from which we, as potentiated life energy must continuously escape, and paradoxically, into which we, as potentially living beings, are continuously reborn. We emerge from Chaos into order, and our consciousness dissolves into that chaotic state for rejuvination and renewal. Thus, we exist resiliently at the creative edge of chaos. We can see, looking back at the point where mind and body connect via these virtual energy exchanges, that our psychic and somatic states are modifiable by one another at this juncture of potential energy with its potentiated form. It is thus our responsibility, as we become increasingly individuated, to modulate as necessary areas which are in need of a holistic tune-up. One manner of doing this is by intentionally choosing to journey toward chaos for creative re-structuring, letting old outworn patterns dissolve. We can self-manage the distribution and management of energy-draining life stresses on the whole mind-body by attending to the primal creative process. It is not an issue of mind-over-matter nor conscious will exerting its agenda over the subconscious. Rather, it is an approach of "mind-as-matter." And this individuation process of self-reflection and self-correction is resilient to the extent that its effects enhance the ongoing life process rather than diminish it. And so, at the end of our life process, when our temporal body is separated from its infinite energy source, its physical remains are, of logical and practical necessity returned for recycling into the larger energic scheme wherein is planted "the Tree of Life." Likewise, we can assume, the infinite life energies over which our bodies temporarily have dominion, must also be returned for recycling within the infinitely larger "pleromal-Abraxas" scheme of things. And somewhere in the middle, the energy demands of being alive (the self-adaptive needs of "Eros") give rise to the "devilish" conflicts upon which our life energies must creatively break themselves in order to adapt and grow stronger, to evolve into ever higher forms of conscious energy. The different intelligences are like the various tones that make up a scale. When we bring them into harmony, we have richer and more resonant experience. Life becomes a symphony that's full of meaning. And this, in a few words, is the Tao of resilience: Eternal answers to life's questions are already wrapped like gifts within the individual, consciousness-channelling, information-transducing mind-bodies of their living participants. It only remains for each of us to expand our conscious life-energies in order to claim those gifts which we already possess and through whose guidance we may continuously become more resilient and harmoniously recreated within the womb of our own evolutionary process.